At this year’s Proms concerts in London François-Xavier Roth gave us a performance of Stravinsky’s ground-breaking ballet The rite of spring on original instruments of the early twentieth century. In the event the performance did not yield as many insights as one might possibly have expected, since many of the period instruments sounded not very different from their modern counterparts. Also Roth failed to persuade his horn players to raise their bells directly into the sky during the passage marked pavillons en l’air as Stravinsky would have expected. The player were presumably naturally reluctant to jeopardise their tuning on the more treacherous period instruments. Without the visual element, one cannot tell whether Stravinsky in this first recording of the score made a mere sixteen years after the riotous premièredid get his horns to put their reputations on the line during this passage, but it certainly sounds like it here. These performances have been available before, including modern CD transfers, and have usually garnered critical complaints because of the fallible orchestral playing. Stravinsky’s sometimes uncertain conducting did not help; the original release on 78s followed hard on the heels of the first complete recording of the work by the conductor of the première Pierre Monteux. Then we must factor in the execrable quality of the recorded sound itself. Mark Obert-Thorn’s re-mastering for this Pristine release cannot do much about the first two problems, but he does manage to get quite listenable sound out of the scratchy 78s even if there is still quite a considerable layer of surface noise; and the dynamic range is surprisingly wide. In his 1946 New York live recording which I reviewed last year (also re-mastered by Mark Obert-Thorn) Stravinsky took about a minute less over his traversal, so his interpretation clearly changed little over the years. He maintained the same driving quality through to his final 1960 stereo version. These later recordings will inevitably be the points of reference for those wishing to hear the composer’s own interpretation of his best-known score. In his notes for the Naxos reissue of the 1946 recording, Mark Obert-Thorn remarked on the “ragged-sounding” orchestra in this 1926 studio reading. Actually they are not too awful, even if they are clearly not comfortable in the more strenuous passages. They and Stravinsky make rather a muddle of the faster sections such as the Ritual of Abduction (track 3). There are also some slightly uncomfortable hiatuses at the side joins between the original 78 sides, as at the end of this track. Some of the string tuning in the following Spring Rounds is decidedly on the queasy side (at around 1.00). Obert-Thorn can clearly do nothing about this, any more than he can about the often fallible internal balances where the closely observed celesta and flutes sound louder than the brass. There is an obvious orchestral fluff at 3.24 in track 13 where during the final Sacrificial Dance a single trumpet clearly wishes to go straight on while Stravinsky makes a pause. For his recording of the Firebird Suite Stravinsky does not follow the original selection of pieces which nowadays normally constitute the suite. He adds the Supplication of the Firebird and the Game of the princesses with the golden apples, anticipating his procedure in his 1945 revision of the suite, although he generally adheres to the original 1911 instrumentation with some amendments dating from 1919. The orchestral playing here, in more conventionally romantic music, is considerably more secure than in the Rite. Stravinsky and the recording engineers thoroughly enjoy themselves, bringing out the string harmonics glissandi in the Introduction (track 14, 1.38) as well as the ponticello effects later on (3.32). 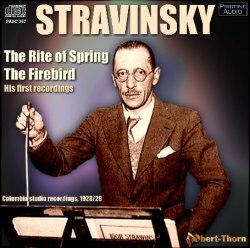 So far as I am aware this is the only recording of the composer conducting any of the Firebird in its original version; the later recordings all employ the 1945 re-orchestration. As such it has a definite value. The orchestral balances, with again unnaturally prominent celesta, are far from natural but the results are nevertheless convincing. The performance of the Infernal dance is spoilt by some split horn notes - as at track 20, 0.10 and at a number of points thereafter - and some splashy playing elsewhere, but it has plenty of excitement and the string pizzicati at 2.38 are nicely and snappily together. It is unfortunate that the Lullaby of the Firebird (track 21) comes to a full close, clearly at the end of a 78 side, and the following eerie transformation familiar from the usual suite is omitted with the final apotheosis shorn of its introduction. The use of the original orchestration in the finale is a vast improvement on the percussive neo-classical revision which Stravinsky used in his later recordings, although the composer’s staccato attack lacks the ideal sense of grandeur and the detached orchestral chords are not always quite together. While Stravinsky’s later stereo recordings will remain the touchstone for those who wish to hear the composer in two of his most celebrated scores, these earliest of his performances on disc nevertheless have value. They convey all the excitement of discovery which so often features in recordings of relatively new music by instrumentalists some of whom may have played in the very first performances. In this new transfer they enable us to hear the originals in vastly improved sound, as well as giving us Stravinsky conducting the original and superior scoring of The Firebird.